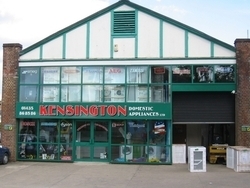 This website is your online link to Kensington Domestic Appliances Ltd.
cookers, all types of refrigeration, dishwashers and every other appliance you could need in your kitchen. Working together each member of staff contributes directly to the running and growth of the company, keeping us in touch with new ideas and product designs. We are a truly independent store. Not a chain, we have one very dedicated retail outlet, its huge (over 7000sq ft) and we sell built in & free standing domestic appliances. We know everything there is to know about the products we sell because our staff training programme is continuous, so you can be sure to get the correct advice for all your kitchen appliance requirements. If you need a simple washing machine that your 84 year old mum can use without trouble, or a super high extraction remote motor ceiling mounted cooker hood to go over your new kitchen island then we will be able to find the right product for you. We keep thousands of items in stock, and we buy in bulk to get the best price we can for you. We regularly price check against the big multiples and other Internet sites, best of all we offer an outstanding after sale service, including full installation and removal by our carefull two man delivery team. You will always get a personal service both in store and on the telephone, before during and after your purchase. Being independent means we can offer you an unlimited product range. We are not tied to any product manufacturer so we will offer you truly independent and honest advice about products and manufacturers and their after sales service. We sell cookers, washing machines, refrigeration, tumble dryers, dishwashers, range cookers, American appliances, hobs & ovens, cooker hoods etc the list goes on! We sell all brands, shapes, sizes and colours if somebody makes it we will find it for you! We sell new perfect products of all makes, we also sell Bosch, Neff & Siemens products as manufacturers graded products. We are members of the Euronics buying group, this gives us access to hundreds of key line items at great prices, with extended guarantee promotions and exclusive models. All our products are backed by standard manufacturers guarantees and in addition our own after sales help to give you complete peace of mind. We are aware of the direct impact electrical appliances have on our environment so we actively promote energy efficient products for your home, and recycling where ever possible.